One of the most common questions I get asked is “What does your strength & conditioning training look like?” To answer that question, I’ve enlisted the help of my S & C coach, Will Badenoch. Programme design is not fancy, you won’t see it in YouTube videos or magazine articles but it’s essential for a successful training programme. For most Jiu Jitsu players, two strength and conditioning sessions a week should be plenty. Anymore may not give your body time to recover and will negatively affect your overall performance. I also suggest following a basic linear periodisation model that includes different three phases. Periodization is basically planning your training so you’re in the best condition possible at the time of a competition or event. With any plan it is important to start with a general preparation and strength development phase. We will then follow this with a Power development phase and conclude our cycle with a conditioning phase. Each phase will normally last for 4-6 weeks depending on the athlete’s needs. The cycle is then repeated throughout the year. It is also possible to only have two phases strength followed by power. However, this would heavily depend on the competition schedule and conditioning of an athlete. Improving your technique should always be your number one goal, no matter what your skill level. However, the existence of weight and age categories competitions are a testament to the importance of strength in the Jiu Jitsu. Simply put, a stronger muscle will find it easier to move an object, it’ll be able to do it faster, and use less energy doing so. For example, a 70-kilo athlete, who can only deadlift 60 kilos, will be working very close to their maximum strength capacity to complete a takedown. If that same person increased their deadlift to 160 kilos they’d require only a fraction of their total strength to perform the same movement, saving themselves a huge amount of energy. 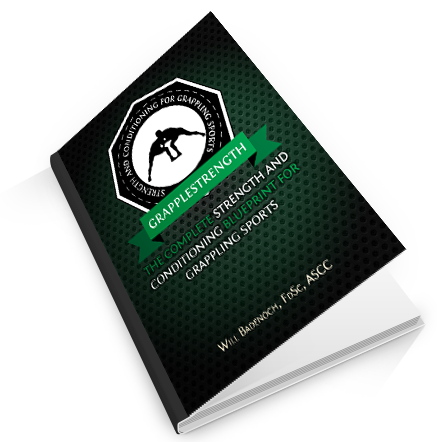 So now you understand the importance of strength, how can you develop it? 1. Mobility, Activation, and Warm Up – The goal of this is to prepare your body for the workout ahead. 2. Priming Circuit – This ‘fires up’ the neurological system ready to achieve maximum force. 3. Main Strength Exercise – This is where the work begins. I’d advise on one of your strength days using a squat variation and the other a deadlift variation. 4. Whole Body Circuit – Chose supplementary exercises to mimic the demands of your sport and give you a complete workout. You can take this opportunity to incorporate some single leg and single arm movements to balance your body and increase core involvement. 5. 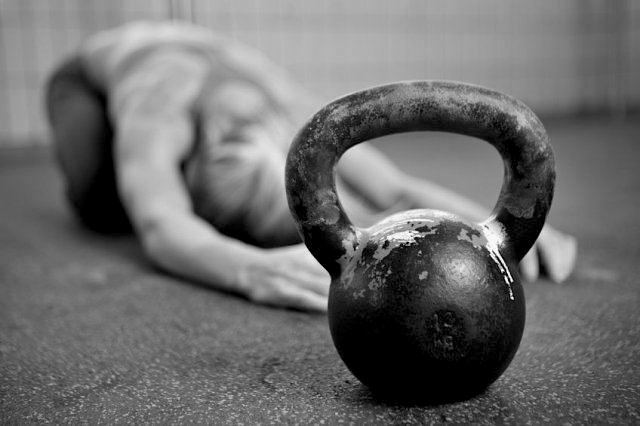 Core Work – Strong core is essential for efficient transmittance of force. A weak core will sap your strength and could lead to injury. Your core will already be fatigued from the previous sections of the workout, so core work can be included with section 6. 6. Whole Body Finisher – This section will start to build your conditioning. However, the rest of the workout can be quite challenging so this section is optional. This may seem like a lot, but in my experience, your workouts should take less than an hour to complete. As you can see, the workout is actually very simple, but can be very challenging. Each workout you should look to increase the weight or number of reps on each exercise, which will lead to continual strength improvements. There is no need to change the exercises every week as it takes on lease six workouts for your body to adapt. I recommend most people add two strength session a week for around 4 – 6 weeks before moving on to the power phase. Remember these strength sessions are to supplement your training not to replace them. A ‘strong’ person who lacks power is like a car jack. They’re capable of moving incredibly heavy objects, but only at slow speeds. On the flip side, an extremely ‘fast’ but weak athlete is like a bow and arrow. They’re capable of moving light objects (like an arrow) at high speeds, but lack the strength to shoot anything heavier. A dangerous fighter is able to combine both these qualities and apply their maximum strength in a fraction of a second. The training methods used to become both strong and powerful are by no means mutually exclusive. On the contrary, getting stronger will lead to rapid gains in power as you train the muscle to work more efficiently and ‘turn on’ quicker. However, it’s important to understand the difference between the two so you can understand the reasons behind the training techniques you’ll use to improve your ability in these areas. The aim of your strength and conditioning training will not be to produce huge energy sapping muscles, but rather to maximise the efficiency of those muscles you already have. Although an improvement in muscle tone and size is almost inevitable, so you’ll look good on the beach with no extra effort. To help you to understand how this is possible, here’s a basic description of the mechanics involved. Each muscle is made up of hundreds of muscle fibres. When you perform an action, such as shooting for a takedown, a signal is sent from your brain to the muscles required to perform that action, telling them to ‘switch on’ and contract. The speed and force of that movement will depend on the number of muscle fibres that are recruited by the signal sent from your brain. No one can voluntarily recruit or ‘switch on’ all of the fibres in a muscle at once under normal circumstances. This is a protective mechanism designed to prevent muscle damage. You may have heard stories of people thrown across rooms by electric shocks. In this case, the electricity has not ‘thrown’ the person but has acted in a similar way to the electric signals that travel from your brain to your muscles when you want to move. With an electric shock, however, the safety mechanisms are effectively overridden. When the shock is received the leg muscles suddenly tense up and every muscle fibre is switched on, contracting rapidly and forcefully, effectively causing the recipient to ‘jump’ across the room. This example illustrates the massive strength and power potential contained within the muscles of even an untrained person, and should help you understand how you can increase your strength without increasing your size or weight. An untrained person will be able to recruit no more than around 60% of their muscle’s potential strength voluntarily. By training with heavy loads at slower speeds, you’re can train your muscle to ‘switch’ on more of its fibres without damaging them and tap into strength reserves that were previously unavailable to you. By also training with lighter loads at higher speeds you’re able to teach these stronger muscles to contract extremely quickly, giving you the strength of the car jack with the speed of the bow and arrow! So, how can you develop power? Each power workout will be broken into six sections similar to the strength phase. 2. Jumps and Throws – Choose one lateral and on linear jump variation and pair it with an explosive medicine ball movement. For the first few weeks, I’d advise using only your body weight, as you progress you can start to add weight. 3. Main Power Movement – In this section, you should choose one hip dominant and one quad dominant power exercise, such as Jump Deadlift (hip) and Speed Squat (quad). These should be lower under control and raised as fast as possible. 4. Whole Body Power Circuit – This will be similar to the strength circuit except using power exercises. 5. Core Work – A Strong core is essential for efficient transmittance of force. Your core will already be fatigued from the previous sections of the workout, so this section can be included with section 6. 6. Whole Body Finisher – This section will continue to build your conditioning and can be used to maintain your strength. The rest of the workout can be quite challenging so this section is optional. Power workout’s don’t have to be long, but every rep should be performed at maximum power, and this can be very tiring. I would recommend adding two power sessions a week for around 4 weeks before moving on to the conditioning phase. Each workout you should look to increase the weight or number of reps for each exercise. If you perform them correctly you will experience a dramatic increase in Power. Technique, strength and power are all valuable tools in your arsenal, but without ‘sport specific fitness’ or conditioning they’ll be rendered useless very quickly. A poorly conditioned fighter with great technique, fighting an opponent with good technique and great conditioning runs the risk of being dominated in the later stages of the fight. However, sports specific conditioning is probably the most misunderstood and potentially problematic area of training. Much of what has become common practice for conditioning has been taken from the circuit style training videos popularised by fighters in YouTube videos. The problem is, the sessions that make it onto YouTube are generally the most interesting NOT the most sensible, and will only make up a fraction (if any!) of a fighters training programme. I’m a firm believer that the best way to condition for any sport is by doing the sport. Every time you step onto the mat you are conditioning yourself. That said you can complement your on-mat conditioning in the gym. During this phase, I recommend using two different workouts; a Power Endurance Circuit and an Interval Training session. 2. Jumps and Throws – Choose one lateral and on linear jump variation and pair it with an explosive medicine ball movement. For the first few weeks, I’d advise only using your body weight and as you progress you can start to add weight. 3. Circuit – Select 3 big strength or power movements (1 upper body push, 1 upper body pull and 1 lower body). Perform 3 explosive reps on each exercise before moving onto the next. Limit rest between exercises to 10-20 seconds and repeat the series for 6-10 minutes depending on your level of conditioning and match length. 2. Jumps and Throws – Choose one lateral and on linear jump variation and pair it with an explosive medicine ball movement. For the first few weeks, I’d advise using only your body weight and as you progress you can start to add weight. 3. Interval Circuit – Push your heart rate into the aerobic training zone using a low-intensity exercise such as skipping, then spike it for short bursts using the much higher intensity exercises. The session should last for 30-50 minutes of continuous activity, depending on your current levels of conditioning. Remember these are supplementary training sessions and most of your conditioning should come from your Jiu Jitsu training. This phase should last for 4-6 weeks and finish just before your competition. 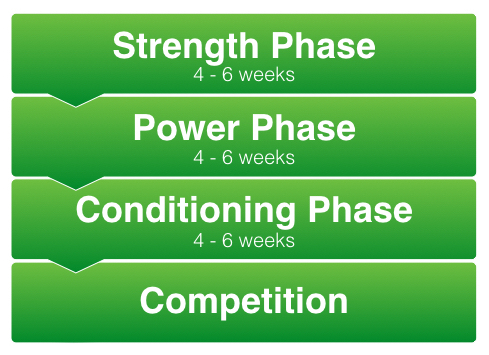 The conditioning phase completes a full cycle of your strength and conditioning programme. You will have seen your physical capabilities skyrocket but don’t stop there! After taking a short rest break go back to week 1 and get stuck back into the programme. The second time through you’ll be familiar with the system, practiced at the exercises, and capable of pushing yourself harder. As a result, expect to see even more dramatic results with each cycle! Look back over your training log as you go and aim to beat the weight and rep records you set previously each week. 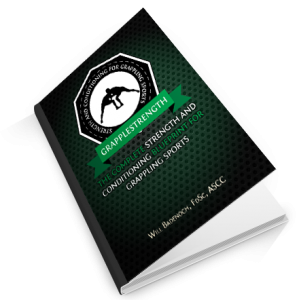 Click the button below to get the Grapple Strength Programme now at the discount price and discover an effective strength and conditioning programme for Jiu Jitsu. Click the button below to learn more.